Our plain sew high speed Fischbein Empress® Series sewing heads are known for their durability and craftsmanship. Our plain sew high speed Fischbein Empress® Series sewing heads are known for their durability and craftsmanship. Constructed from heavy duty metal components, the versatile and compact Empress sewing head is designed to securely close filled open mouth; multi-wall paper, woven and laminated woven polypropylene bags in the most demanding work environments. Fischbein’s pressurized, self-lubricating system protects moving parts and ensures maximum productivity with low maintenance. The Empress sewing head’s precision rotational parts allow for adjustable operating speed from 55 to 75 feet per minute with very little vibration. Our standard plain sew models create a two-thread, double locked stitch adjustable from 2 to 3.5 per inch, factory set at 2.5 stitches. A wide variety of accessories are available for Fischbein sewing heads. Among them are various mounting pedestals, power infeed systems, a full range of conveyors, bag-top folders, thread and tape-break detectors, bag coders, and photoelectric controls for system integration. For maximum performance use Fischbein sewing thread and genuine Fischbein parts. Our standard tape sew Fischbein Empress® Series Sewing head is known for its durability and craftsmanship. Constructed from heavy-duty metal components, the versatile and compact Empress sewing head produces a secure, attractive crepe tape sewn closure on multi-wall and laminated woven polypropylene bags in the most demanding bag closing environments. Fischbein’s pressurized, self-lubricating system protects moving parts and ensures maximum productivity with low maintenance. The Empress sewing head’s precision rotational parts allow for a very smooth, adjustable operating speed from 35 to 55 linear feet per minute. Our standard tape sew model creates a two thread, double lock stitch adjustable from 2 to 3.5 inches per inch, factory set at 2.5 stitches. An optional, easy-open one thread stitch feature is available. A wide variety of accessories are available for Fischbein sewing heads. Among them are various mounting pedestals, power infeed systems, a full range of conveyors, bag-top folders, thread and tape-break detectors, bag coders, and photoelectric controls for system integration. For maximum performance use Fischbein sewing thread and genuine Fischbein parts. 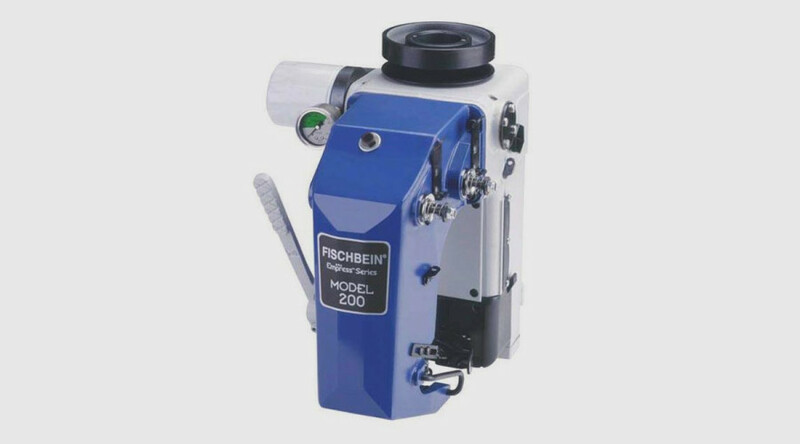 The Model MFR200 Fischbein high speed bag stitcher with automatic folding device. High speed sewing head, used for plain sewing of every type of open-mouth bags, including paper, woven polypropylene. Typical application for this sewing head: potatoes packing line. Sewing head requires to be mounted on an appropriate frame and the mandatory use of a fan specially designed to cool the unit during operation (not delivered with the unit).